With just three games left to reveal, we're happy to announce that Number 3 on our list of Top 10 VR Games goes to Beat Saber! 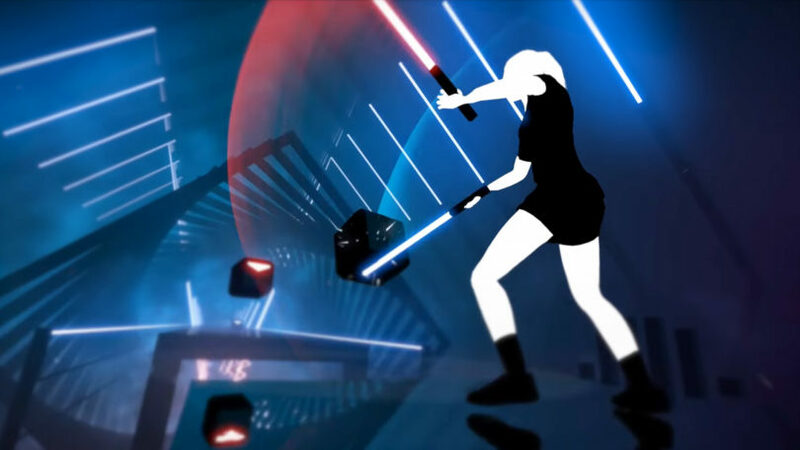 A rhythm game like none other, Beat Saber is similar to Guitar Hero if you replaced the standard guitar controller with two very real lightsabers. If dual-wielding laser swords isn't enough for you, you'll be cutting down approaching blocks in the indicated direction, making sure to slice each one with the corresponding saber, whilst frantically dodging approaching red walls. Choose from a range of custom songs, including well known titles such as Toto's Africa, and feel the beat flow through you in order to beat your friends' high scores and rise to the top of the leaderboards. A range of difficulties from Easy to Hard provide just the right challenge for any player, but dialling the game up to Extreme is a task only the brave can handle! Just how good are your music skills? Come experience the game that has groups coming back to Virtual Hideout over and over, just for another go. Ask us for a free trial of Beat Saber today and we're confident you'll be staying for the hour!